Raster CRT Typography – the glyphs drawn by DEC VT100 and VT220 terminals #Typography #DEC #VintageComputing #Fonts « Adafruit Industries – Makers, hackers, artists, designers and engineers! Recently, I engaged in a bit of analog media emulation, namely for the purpose of the reenactment of raster CRT graphics as seen on “glass terminals” like the iconic VT-series by the Digital Equipment Corporation (DEC). An endeavor, which raises a few questions, like, is there anything special to the media, what did the fonts really look like, and can we reconstruct them from specifications? 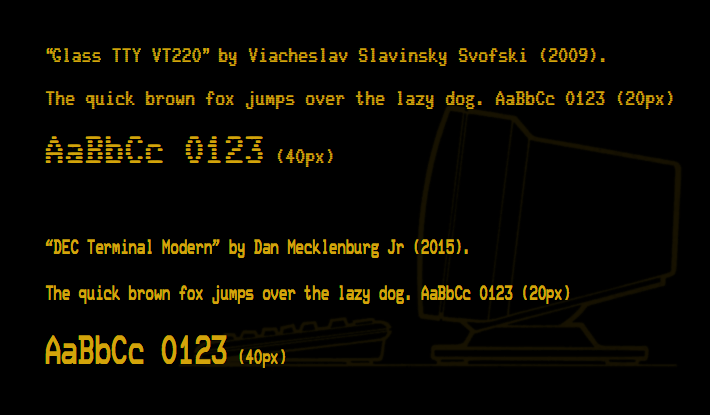 Modern TrueType fonts recreating the glyphs of the VT220. 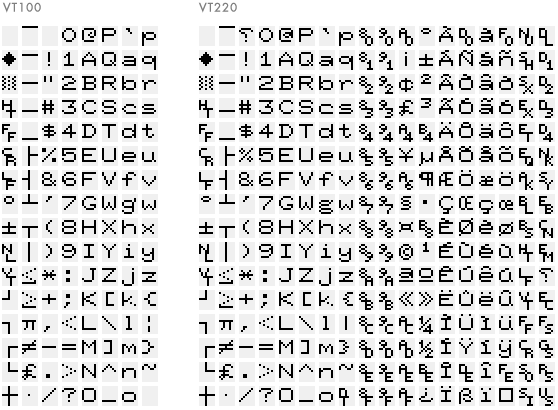 Mind that the VT-terminals supported two resolution modes, one at 132 characters per line and one at 80 characters (char-matrix 9×10 and 10×10, respectively), the latter introducing an extra spacing of one pixel. Having a closer look at the two fonts, there are some notable differences (the differences in spacing may be explained by the two characters per line modes of the VT-terminals), however, neither looks right. Comparing them to photos of the similar VT100, there are discernible differences, not only in the font weight, but also in the size and form of the contours and the overall “feel” of the font. However, the apparent confusion about the weight of the font isn’t especially helped by photos of the real thing either, as the impression conveyed by them differs widely by lens, exposure and camera settings used. 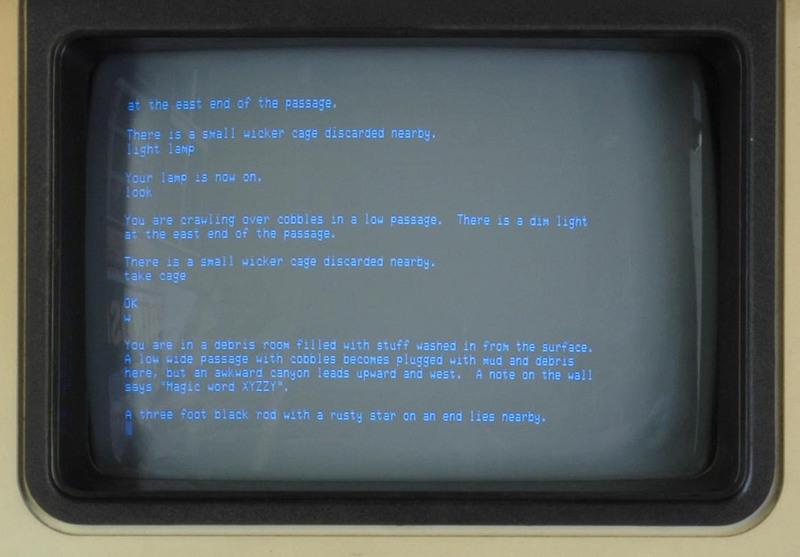 VT100 displaying Adventure / Colossal Cave Photo: Wikipedia, Dave Fischer, 2008, Wikimedia Commons (edited, N.L.). Since ROMs are available, we may start there, since they are the closest, we may get, to the real thing, aren’t they? What could possibly go wrong? Now, this doesn’t look right either. Obviously, the glyphs will be rendered stretched vertically to about double height, but there’s more going on here. The characters just don’t look right. P.e., have a closer look at “p” and “q” or the offset in the dots of the downward right stroke of “k”, not to speak of the funny digits “6” and “9” of the VT100 or the distorted “2”! Moreover, at a closer look, the character matrix is just 8×10, while we expected at least 9×10 (and 10×10 for 80-cols mode) — as described in the specifications. Clearly, this is not what is displayed on the screen. See the rest of the article including the author’s take on recreating the fonts. Ed. note: hopefully such fonts can be used in PyPortal and other recreations of vintage electronics. Are you a vintage terminal/computer fan? Let us know in the comments below.